Semi-finished contact pre-materials can be manufactured from solid precious metals, precious metal alloys, or precious metal containing composite materials. 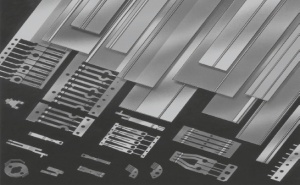 They are made in wire, strip, and profile form by known processing technologies such as extrusion and subsequent annealing and drawing or roll-forming. They are supplied following the manufacturer's internal standards usually related to DIN EN specifications for copper based materials. The most important materials are two – or multiple material layered semi-finished materials with the contact material bonded in its solid phase to non-precious carriers by cladding, brazing, or welding. The contact material can also be deposited on the carrier from the liquid or vapor phase. Clad materials consist of two or more layers of different materials, the contact material and the carrier, which are firmly bonded to each other. Depending on the electrical requirements the contact material is mainly an alloy of gold, palladium, or silver based while the carrier material are mainly copper alloys. To bond these materials various technologies are utilized, the two most important ones being described in more detail below. During hot cladding, the classic process, the materials to be clad are assembled into a cladding package in block or plate form, heated to about 800°C and clad (or "welded") together under high pressure Figure 1. At the interface between the two materials a non-separable bond is formed by either diffusion of the reaction partners or in liquid phase by forming a AgCu eutectic alloy when an additional brazing alloy foil is placed between the two materials. 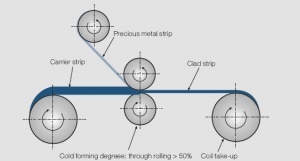 Further processing is done by rolling with required annealing steps between subsequent thickness reductions. The disadvantage of this process is the usually limited short length of final material strips. 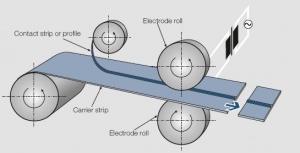 In the Cold Roll-Cladding process the bond between the contact and carrier material is achieved by cold deformation of > 50% in one rolling pass Figure 2. The high plastic deformation causes cold welding in the boundary layer between the two materials. To increase the quality and strength of the bond a subsequent diffusion annealing is performed in most cases. This process is most suitable for clad semi-finished strips with thin contact material layers (≥ 2 μm) and large strip length (> 100 m). When specifying the contact material layer thickness it is recommended to use the minimum required thickness. Strength properties and dimensional tolerances of clad contact bi-metals are derived from the standards DIN EN 1652 and DIN EN 1654 for Cu alloys. 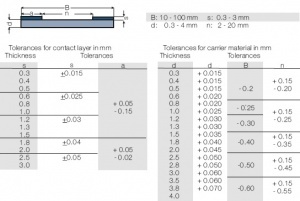 When specifying the width of the contact material layer it is recommended to use the minimum required value. All dimensions should be specified originating from one strip edge. The toplay process starts with a flat or profile – shaped contact material strip which is fed together with the wider non-precious carrier material and in most cases an intermediate thin foil of brazing alloy into a induction brazing machine Figure 5. An evenly distributed and reliable braze joint can be achieved this way between contact and carrier materials. The combined material strip is rather soft after the brazing process and re-hardened during a subsequent profile rolling step. In this way different shapes and configurations can easily be achieved. Cu, CuZn, CuSn et al. Strength properties and dimensional tolerances of toplay profiles are derived from the standards DIN EN 1652 and DIN EN 1654 for Cu alloys. Seam–welding is the process by which the contact material in the form of a solid wire, narrow clad strip, or profile is attached to the carrier strip by overlapping or continuous weld pulses between rolling electrodes Figure 9. The weld joint is created by simultaneous effects of heat and pressure. Except for the very small actual weld joint area the original hardness of the carrier strip is maintained because of the limited short time of the heat supply. Therefore also spring-hard base materials can be used without loss of their mechanical strength. The use of clad contact pre-materials and profiles allows to minimize the use of the costly precious metal component tailored to the need for optimum reliability over the expected electrical life of the contact components. Cu, CuSn, CuZn, CuNiZn, CuBe et al. Strength properties and dimensional tolerances of toplay profiles are derived from the standards DIN EN 1652 and DIN EN 1654 for Cu alloys.. Contact profiles span a broad range of dimensions. Width and thickness are typically between 0.8 – 8.0 mm and 0.2 – 3.0 mm resp. Special configurations, often defined as miniature-profiles or even micro–profiles can have a width < 2.0 mm. Miniature–profiles are mostly composed of a contact-bimetal material with the contact material being a precious metal alloy or composite material clad, welded or coated by electroplating or vacuum-deposition (sputtered) onto a weldable base material. Since these profiles are attached to carrier strip materials usually by segment– or seam– welding to the base materials, materials with good welding properties such as nickel, copper-nickel, copper-tin, as well as copper-nickel-zinc alloys are used. The bottom surface of the profiles usually has formed weld rails or similar patterns to ensure a solid continuous metallurgical weld joint between the profile and the contact carrier. Contact profiles in larger sizes are often used for switching devices in the low voltage technology. For these the contact layer mostly consists of arc erosion resistant materials such as silver–nickel, silver–metal oxides or the weld resistant silver– graphite. The brazable or weldable underside of the metal oxide or silver–graphite materials is usually pure silver with also quite often a thin layer of a phosphorous containing brazing alloy applied to aid the welding process. Beause of the variety of configurations of contact profiles usually the quality issues are separately agreed upon between the manufacturer and the user. The thickness of the Au top-layer, which is sputtered for example, is between 0.2 and 5 μm, depending on the requirements. Tolerance of thickness is about ± 10%. This page was last edited on 21 September 2014, at 12:16.